Kindly Notice: ATV110-Madix-21 is fully assembled ATV110-Madix, will ship out directly, no need to wait! 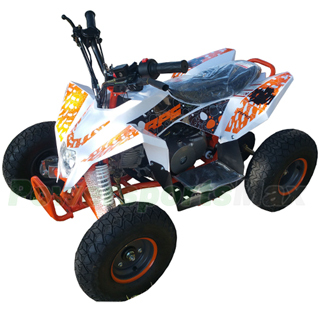 110cc of reliable, electric-start four-stroke fun feed into a gearbox, making the ATV-W008 a great choice for those getting started or moving up, and perfectly tuned to the rider starting to hone his or her ATV skills. Front and rear 14.5x7-6 tires offer excellent traction and help boost ground clearance. Compact chassis design creates the ideal 29.5" wheelbase and low center of gravity for light, quick, super-accurate steering. 1.5L Fuel Tank for good distance riding. Shipping charge for one single unit of ATV-W008 is $199.95(Please login to see real shipping charge for these states: Florida, New York, District of Columbia, Connecticut, Maine, Maryland, Massachusetts, Montana, New Hampshire, New Jersey, Pennsylvania, Rhode Island, Vermont, West Virginia, Delaware, etc.) , and you will get discounted shipping price if you order multiple item. The atv looks exactly like the picture on the web. it starts right up and has plenty of power. it has a comfortable ride and is well balanced. my kids love them. The ATV-W008 is a lot of fun, runs great and is built well. As a midsize four- wheeler, you aren't going to find a better value for the money. I am well satisfied with your product. I would refer your product to my friends and any one else who would be interested. Very easy to start Runs and handles great. Works very good for my kids. Should work for yours. My grandson has been riding it for TWO month now, and works great. I'm very satisfied with the product. Seems to be fairly tough. I have been completely satisfied with this Dealer. They have been prompt and very courteous. The ATV runs as it should and was easy to assemble. Great prices easy to use simple to check out ..